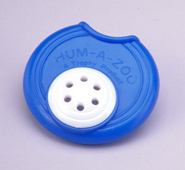 Hum-a-zoo's are played by humming into the instrument (just like a regular kazoo). Made of durable plastic, this instrument measures about 2 inches across. If you can hum, you can play your favorite tune... Fun for Everyone.